micturates: to pass urine; urinate. crepuscular: of, pertaining to, or resembling twilight; dim; indistinct. 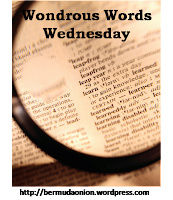 What fun words this week! One guesses that Kevin goes out when it's crepuscular to see an ecdysiast and it makes him micturate! Next was full of great words, wasn't it? Thanks for playing along today! Love to see someone calling out crepuscular. One of my all-time favorite words. hm, he seems like a show-off. Those words (especially #1 and 3) are just unnecessary! Now I love a good 50-cent word but not at the expense of understanding.